The moon and sun wait for no one. I was late, and a traffic light stuck forever on red made it even worse. By the time I arrived at Dan’s Camera City, I had only 15 minutes before first contact, the beginning of the solar eclipse. It was cold, very cold, and the assembly of my telescope gear seemed to go in slow motion, taking forever to screw a solar filter in place as fingers became quickly numbed by the cold and wind. At 11:10 a.m. it happened, right on schedule, just like my computer program had simulated it in dozens of classroom demonstrations. Matt and Marcella Gustantino of Orefield saw the first nibble of moon against sun while I was aligning my scope, and others were arriving. The celestial clockwork ticked; the dance of the heavens unfolded in precise harmony. There were no delays, no reprieves, no second chances. It was a good lesson to experience, especially since I almost always run late. About five minutes afterwards, I was focused and tracking the dance with a distinct chunk of the sun already gone. For the next three hours over a half dozen scopes entertained about a dozen volunteers and about 150 Valley residents who dropped by to witness the dance and to chat. For those who saw the Christmas eclipse, either at Dan’s or throughout the Valley, it was a testament to the human desire to behold events in real time. Sure, watching the eclipse on the Internet was more comfortable, and still commendable, but the view was from the bleachers. 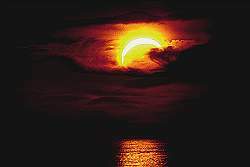 Those who observed the event outside saw the real photons of eclipsed sunlight enter their eyes and became true participants of the heavenly dance. They were truly onstage with the actors as the moon courted the sun. Bravo! A special thanks is extended to Dan Poresky, owner of Dan's Camera City, for allowing this event to take place at his store parking lot, as well as the other volunteers who supported this event: Matt and Marcella Gustantino, John and Jane Sumerfield, Jesse Laufer, Jesse Leayman, Rosa Salter, Fran Kittek, Fred Bomberger, and John Weinhold (from Pittsburgh). "Be real cool" with your new Eclipse Shades! STOCK COMPLETELY SOLD OUT... An Eclipse Shade is a special device which can be safely used to view the partial solar eclipse of Monday, December 25, 2000. 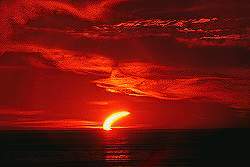 Solar eclipses occur when the Moon hides part or all of the sun, and they are a rare astronomical event not to be missed. Although there are many different ways to safely view a partial solar eclipse (see below), it is imperative for direct viewing of the sun that a safe filtration system be adopted. Eclipse Shades do precisely that by eliminating the sun’s harmful infrared and ultraviolet light and reducing the sun’s brightness to a pleasant intensity level. 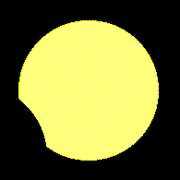 Eclipse Shades will produce a beautiful yellow image of the sun. Wear Eclipse Shades like glasses, or over glasses. Eclipse Shades, however, are not a toy. Eclipse Shades should not be used with any other optical equipment such as cameras, telescopes, or binoculars. Children should always be under the supervision of an adult when using this product. Eclipse Shades are available for $2.00 per glasses from Dan’s Camera City, 1439 W. Fairmont St., Allentown, PA 18102, 610-434-2313. They make a great stocking stuffer or Holiday party favor. All proceeds will benefit the continued operations of the Allentown School District Planetarium. 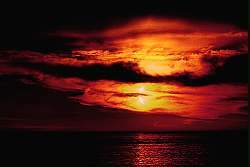 SOLAR ECLIPSES AND TRANSITS: WHY THE DANGER? Observing the sun with the unprotected eye during a partial solar eclipse is as dangerous as looking at the uneclipsed sun. It is always dangerous to make unfiltered, direct observations of the sun--a l w a y s ! The eye gathers light similar to any lens, focusing this energy onto the photoreceptor cells (rods and cones) of the retina. Infrared radiation from the sun, which we detect as heat, is the main culprit in retinal burns. This destroys the eye’s ability to process the gathered light, creating a blind spot in the eye’s vision. The threshold temperature for causing permanent thermal lesions is 140 degrees F. (60 degrees C.), about 41 degrees F. above the normal body temperature. Temporary visual impairment can result with as little as a 4 degree F. rise in the temperature of the photoreceptor cells. Ironically, while retinal burn is occurring, there is absolutely no pain involved other than the normal discomfort of observing a bright light. or your eyes will become toast! NEVER, NEVER, NEVER use sunglasses, multiple pairs of sunglasses, UV (ultraviolet) absorbing sunglasses, colored cellophane, colored filters, neutral density filters (from photo stores), polarizing filters, fully exposed color negatives or fully exposed black and white (silverless) photographic negatives, or glass smoked by the soot of a candle flame to make filtered, direct observations of the sun. All of the above can cause retinal burns and vision loss. And NEVER use a dark absorbing filter attached to the eyepiece end of a telescope. A telescope’s main function is to gather light--to make objects appear brighter. Even small telescopes gather dozens to hundreds of times the amount of light that the eye normally receives. A telescope focuses the much brighter and hotter solar image near the position of the dark absorbing filter for inspection by the eye. The absorbed light will cause the filter to become very hot and can lead to breakage and almost certain permanent damage to the eye of an unsuspecting observer. Viewing a Transit of Mercury or Venus across the sun's disk requires a telescope in addition to safe observing techniques. Proper filtered viewing of the sun with just the eye will not produce an image of the sun large enough for Mercury to be seen. There are many ways to conduct inexpensive, safe observations of the sun during the partial phases of any solar eclipse. These methods can be divided into two main categories: projection of the solar image onto a screen, which is an indirect method, and directly viewing the sun by safely filtering its light before it enters the eye. Let’s start with projection techniques. 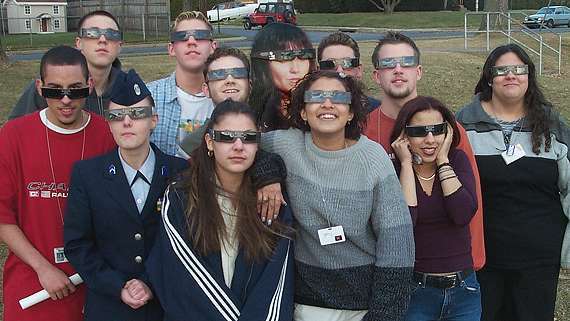 Indirect viewing methods provide the safest means of monitoring the progress of a partial eclipse. 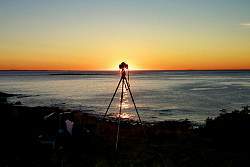 Telescopes, binoculars, monoculars, and pinhole systems can be used to project an image of the sun onto a screen, thus avoiding the need to look at the sun directly, and at the same time, providing a show that several people can watch safely. This image was scanned from Bryan Brewer's book Eclipse printed by Snohomish Publishing in 1978. INSTRUCTIONS: Cut a small rectangular hole about two inches by one inch in the center of one of the long ends of a rectangular box. Tape or glue the aluminum foil over this hole. Prick the aluminum foil with a pin to create a circular aperture. Glue or tape a piece of white paper opposite the pinhole on the inside of the box. If the box is big enough, observe the sun’s image on the white screen by placing your head in the box, eyes looking toward the screen. In such cases put the two inch by one inch hole to one side of the the long end of the box. This will allow for more headroom. Point the box so that the pinhole faces the sun. If the box is smaller or a tube is used, cut an opening in the side of the tube or box so that the screen can be viewed from the exterior. The length of the box or projection distance should be about 200 to 500 times the diameter of the hole. A crisp ¼-inch diameter hole in a tablet-sized piece of cardboard would work nicely for an observer standing 4-10 feet away from a white screen, while a 1/8-inch hole would suffice for a 2-5 foot projection box. A one millimeter pinhole would be sufficient for an 8-20 inch projection distance. DIFFICULTIES: The images acquired with pinhole projections are neither very sharp nor very bright. The pinhole solar projector made from a tube is more difficult to use because it must be pointed at the sun with a higher degree of accuracy. Observations of the sun with this method do not work well when the sky is hazy. Never try to observe the sun directly through the pinhole!!! Projected solar images can also be viewed without any optical devices under a well-foliated tree. The spaces between the leaves of a tree act as pinhole lenses, forming a multitude of small crescent images of the partially eclipsed sun on the ground. A white bed sheet or white cardboard placed under a tree will enhance your view of these projected solar images. Lacking any suitable tree, the same effect can be produced by piercing any large flat opaque screen with holes about 1/16-inch to 1/8-inch or by crisscrossing the fingers of one hand with those of the other. Try using pegboard as another device which will produce a myriad of solar eclipses on the ground. 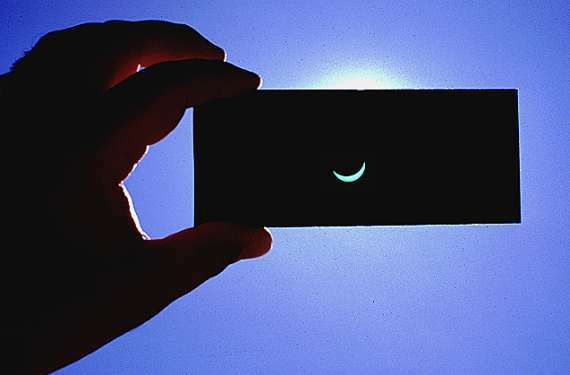 The photo below was taken by Adam Jones in Canutillo, Texas during the annular eclipse of May 10, 1994. Tree leaves provided the pinholes from which the projections of the ringed sun were created. A white sheet was used to enhance the contrast of the image taken with a point-and-shoot camera. INSTRUCTIONS: The myriad "pinholes" which are created as leaves slowly move in a tree can simultaneously produce thousands of images on the ground. Sunlight shining through the holes created between crisscrossed fingers will produce nice eclipse images on a white sheet placed on the ground. DIFFICULTIES: Images formed by trees will probably be moving and, therefore, more difficult to follow. The crisscrossed fingers will produce very fuzzy images. These techniques will not work as well on a hazy day. INSTRUCTIONS: Use the telescope as an optical projection system by pointing it at the sun and allowing the sunlight which it collects to pass through an eyepiece and project onto a piece of white cardboard. Adjust the focuser to sharpen the image. Be sure to shade the cardboard with a baffle to increase contrast of the image. 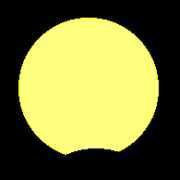 A solar image about twice the size of the aperture of the telescope (light gathering diameter of the lens or mirror) is optimal. If you are using binoculars to project the sun's image, cap one of the sides or alternate the capped side to prevent heat build up and damage to the optics. For telescopic projections, minimize the heat build up by keeping all optical surfaces clean. 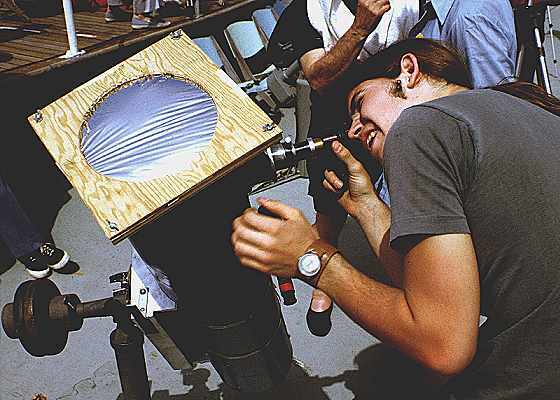 Use a cardboard stop to reduce the telescopes aperture to two or three inches, and do not keep the instrument pointed at the sun for periods longer than two minutes. As a matter of safety, make sure that all finderscopes are either removed or covered and never leave your telescope unattended. DIFFICULTIES: Do not try to locate the sun by looking directly through the telescope or binoculars. Instead, find the sun by manipulating the instrument so that the shadow of the tube presents the smallest possible surface area on the ground. Cover any smaller finder scope to prevent others from trying to peek at the sun directly. Use inexpensive eyepieces with uncemented lenses (Ramsdens or Huygens) to reduce any eyepiece damage due to excessive heat. You can occasionally cap your instrument and allow the eyepiece to cool down. Projecting the sun's image with a refracting telescope. Direct filtered observations involve the transmission of the sun’s image through a material transparent enough to allow the sun to be clearly seen, but at safe enough intensity levels so that visible, infrared, and ultraviolet radiation cause virtually no increase in retinal temperatures. To be on the absolutely safe side, these filters should never be used to view the sun for durations of time greater than 30 seconds. These short intervals allow the eye to dissipate easily any minimal heat transmitted by these filters. Filters made from safe materials should always produce images of the sun which are comfortable to view. Whenever a solar filter made from the appropriate materials produces an image which appears uncomfortably bright, the filter may not be meeting its safety specifications, and should be immediately discarded. Children should always be under the supervision of an adult when direct filtered solar observations are being made. Since these filters produce sharp images of the sun, they will work well during all portions of the eclipse as long as the sky remains reasonably clear. 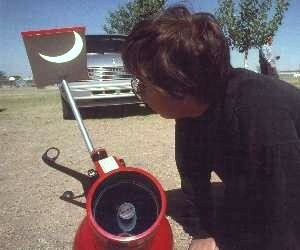 Here is a safe and inexpensive way of observing any partial solar eclipse or Venus transit. The dark Mylar glasses produce a bright yellow image of the sun. The aluminized Mylar (seen above) will provide you with a pleasant blue image of the sun. Both are totally safe for solar viewing. After the eclipse, don't throw them away, because they can be used for future solar eclipses. Eclipse glasses are available from Dan's Camera City, 1439 West Fairmont Street, Allentown, PA 18102. Their cost is $2.50 per glasses, and all proceeds benefit the continued operation of the Allentown School District Planetarium. 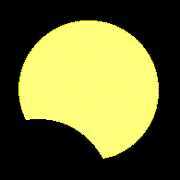 Contact John Evrard or any of Dan's capable staff for availability of Eclipse/Venus Shades. Phone: 610-434-2313. DISCUSSION: These filters consist of two aluminized mylar sheets. When sandwiched together, they produce a pleasing metallic blue image of the sun which poses no safety hazards to the eye. Always use two sheets of aluminized mylar. They make excellent filters for naked eye views of the sun, and when properly secured over the front of a telescope or binoculars, they allow for safe inspection of the magnified sun at the eyepiece. Never use these filters at the eyepiece end of a telescope or binoculars. The mylar will quickly melt from the concentrated amounts of energy that the telescope is gathering. AVAILABILITY: Contact Roger W. Tuthill, Inc., 11 Tanglewood Lane, Mountainside, NJ 07092. Phone: 800-223-1063, 908-232-1786, or Fax: 908-232-3804. Tuthill markets Mylar in various sized sheets under the name Solar Skreen. DISCUSSION: Heavy duty, high amperage welding requires a dense enough glass filter which has also proven extremely safe and popular for viewing the sun. These filters are not of a high enough optical quality to be used as front end solar filters for telescopes. In the less expensive varieties, they produce a solar image which is green. Gold coated #14 Welder’s Shade filters will warm up the solar image to a more natural color. AVAILABILITY: Order from J.W.S. Technologies, 1701 East Race St., Allentown, PA 18103. Phone: (610) 266-1500. The company is located behind Lehigh Valley International Airport near the control tower. These filters are normally not in stock, except for the #14, 4-inch by 5-inch size, green filter, but they can be acquired in about one week. Prices can be found below the photo. Composite photo by Allen Seltzer, using a #14 green welder's filter. DISCUSSION: These filters made from light-saturated Kodak Kodalith Ortho film, developed with Kodak Kodalith A and B chemicals, produce a pale yellow image of the sun which is safe and pleasant to view. Kodalith is a silver-based graphic arts film of extremely high contrast. This film should be exposed to an intense even light source, such as the sun, for at least one minute. 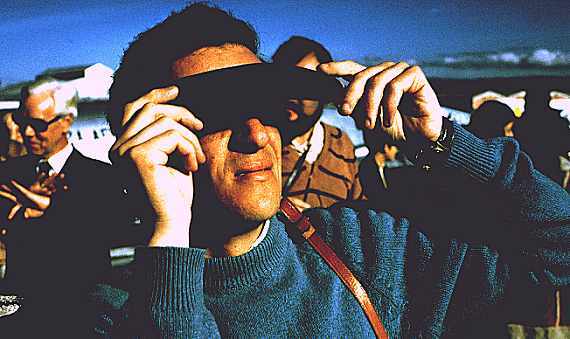 After processing, the film can be mounted as strips in cardboard to accommodate viewing the sun with both eyes simultaneously. An even less expensive method is to mount the film in 2-inch by 2-inch cardboard slide mounts. It is advisable for even greater safety to tape the cardboard mounts over a hole cut in a larger piece of cardboard which will completely cover the other eye while observing the sun. A simple, safe, and inexpensive Kodalith solar filter... Photography by Allen Seltzer. About five minutes after rise, the sun emerged for one last hurrah before disappearing behind the denser cloud bank visible near the top of the photo. It was near maximum eclipse at this point, about 91 percent. The 500mm, F/8 exposure at 1/250th of a second was shot with Prof. Kodachrome 200 film. The morning before the partial eclipse, I tested what my computer and compass had indicated would be an excellent viewing site. The chosen location was Blueberry Hill on the Schoodic Peninsula near the town of Winter Harbor, Maine. Inclement weather was predicted for eclipse morning. The time was 4:45 a.m. 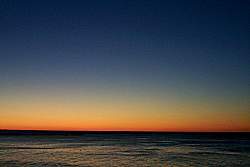 The sun rose over open waters at 5:28 a.m. on August 10, right on target, confirming Blueberry Hill as an excellent location for photographing the eclipse. 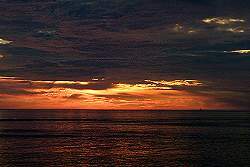 This digital image was taken about five minutes later to emphasize sky conditions and coloration during a normal sunrise. My tripoded Nikon camera was used to occult the sun. 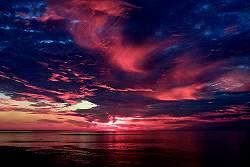 Five minutes before sunrise on eclipse day the sky lit up in various shades of lavender, red, and orange. 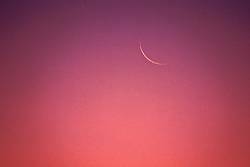 The faces of the two dozen observers, watching the brightening eastern horizon, glowed pink. Click on any of the photos to make them larger. 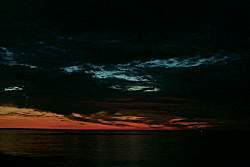 This is a close up of the eastern horizon about five minutes before sunrise. The overall lighting seemed to be less intense than a normal sunrise. 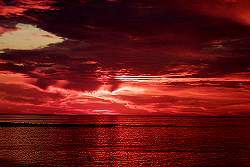 The reddening effects were certainly due partly to the cloud cover. But the nearly eclipsed sun also played a part too. 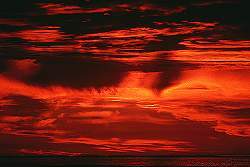 The sun's temperature near its limb is cooler, and therefore, this light would appear more red to the eye. It was this redder light that we were seeing when this picture was taken. This picture further narrows the field of view to what a person looking with binoculars would have seen 5-10 minutes before sunrise. The redness of the photo was more obvious than visual observations of the same area. 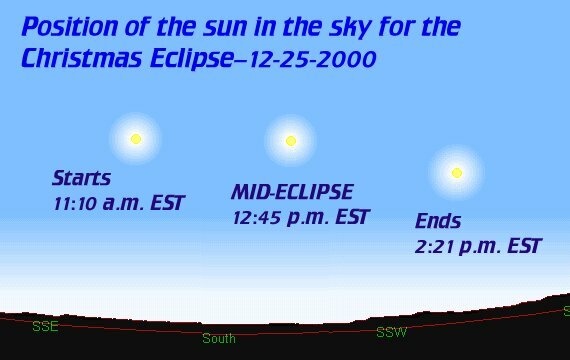 The Feb. 26, 1998 solar eclipse from Allentown (right to left): 12:38 p.m., 01:17 p.m., 01:55 p.m.